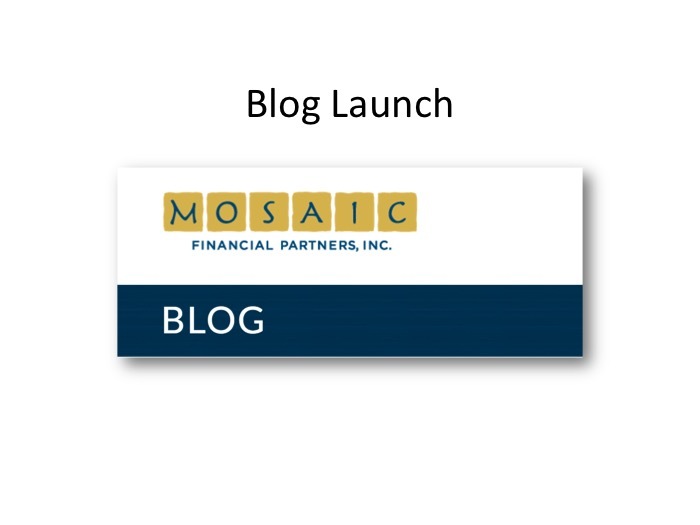 Project Details: Mosaic had a long-running paper newsletter when I first came on board, and one of the first requests from the CEO was to use this process to launch a blog. The purpose of the blog was to provide opportunities to demonstrate thought leadership as a firm and help each advisor build a reputation as recognized experts in their areas of specialization. Other goals for the blog included increasing the search engine rankings for the firm website by producing fresh content targeting important SEO keywords. Also, we wanted to mostly create evergreen content that could be reused as fodder for business development purposes. One particularly successful thread was a series of articles and video content on topics related to “incentive stock options,” which resulted in page 1 ranking for this key phrase. One of the advisors was an expert in this area. Deliverables: Blog design brief, oversee web design and development contractors, editorial calendar, topic ideation, keyword research, ghostwriting articles, editing, graphic design. “Evaluating Charities” – I wrote and edited this article. “[Video] Qualifying Holding Periods for Incentive Stock Options” – Main content was a video segment of a recorded webinar. I edited the video and wrote the accompanying description.